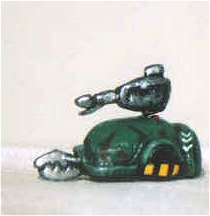 The Sergeant Bash Roborally model is inspired by the game show Robot Wars UK. It's got pliers on front, the sergeant stripes on the side, and a flamethrower on top. The wheels on the sides are protected by a thick metal bar. Because I made the epoxy model in stages, I forgot to take the pliers into account for measuring the width of the model, so it's a little bit too wide for a roborally square.